20 x 28 1/16 in. Although John Singer Sargent was American, he spent most of his life abroad. 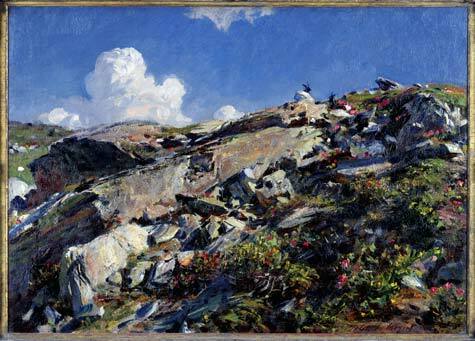 His artistic training encouraged rapid painting rather than the execution of countless studies, and this expressive canvas showcases Sargent’s quick brushstrokes. Painted in the Simplon Pass in the Oberland Alps of Switzerland, this painting’s rocks and flowers emerge from its thick texture. Having gained fame as a portraitist, Sargent was able to suspend new portrait commissions after 1907 and devote his time to watercolors and landscapes.